Going along with Brother Barley’s recent modification of the beer tasting section in “Beer 101,” I thought it might be interesting to write about where some of the flavors in beer come from. Although you already know that there are only 4-5 ingredients in beer (water, grain, yeast, hops, and sometimes adjuncts), craft beers can have impressively complex flavors that result from hundreds of different flavor molecules in the brew. Some of these molecules arise from the fermentation process itself, many others are directly extracted from the grains or hops during brewing, and still others are formed by chemical reactions with light, oxygen or other components of air. As a homebrewer, or just someone who is interested in beer, knowing a little bit about beer chemistry can help you understand what goes into your brew and how to understand and avoid undesired flavors. Beer has been around for thousands of years, and a lot of very smart people have spent time trying to understand it. For example, I spent my entire college career pondering the bottom of an empty plastic cup that recently contained the finest brew – no, make that the cheapest brew – around. The subject is complex enough that several textbooks have been written about it, but I’ll try to touch on some of the important things here. If this is too much, just take a look at the pictures I’ve provided to see some of the interesting structures (click on the picture for a high res version). 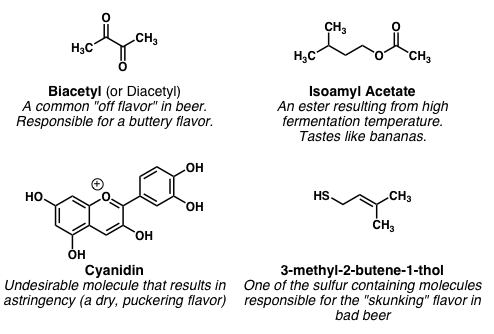 If you really want to geek out on beer flavor chemistry, read on! One of the things to remember about beer is that it’s a balance: too much of a “good” flavor can really ruin an otherwise decent brew. Likewise, traditionally “off flavors” can be components of some excellent beers, as I’ll talk about a little later. So what makes up the complex flavor of beer? In general, flavor is made up of taste and scent. Your tongue can taste only five different things, roughly categorized as salty, sweet, bitter, sour, and savory. Your nose, on the other hand, is a much more sensitive organ that can detect millions of scents. Amazingly, olfaction is still not very well understood – a Nobel prize was awarded just in 2004 to scientists who helped work out how scent receptors in the nose work. Molecules that you can smell tend to be somewhat smaller and have lower molecular weights, a property that enables them to evaporate more easily. Of course, one of the most critical molecules in beer is ethanol. Ethanol is a low molecular weight alcohol that contains two carbons, and is the friend of college students and drunks like us around the world. Ethanol is a product of the fermentation (or anaerobic metabolism) of sugars such as glucose and fructose. Sugars, (whose names generally end in “–ose”) such as these are the most abundant organic material on earth. When you soak grains with hot water to make your wort, you are extracting complex mixtures of sugar polymers from the grains into the water. These sugar polymers are called starches and are long chains of repeating units of glucose, fructose, and sometimes other sugars. Sucrose, for example consists of one glucose and one fructose molecule, maltose is two glucoses linked together, and amylose is a chain of 4-1000 glucoses. Along with sugars, you extract enzymes such as glycosidases (enzyme names typically end in “-ase”) which hydrolyze, or break up large chains of sugars into smaller, fermentable sugars such as glucose or maltose. Unfermented sugars add to sweetness and body of the beer, so they still serve a purpose! The other main components of beer are from hops. Hops provide bittering principles to beer, and a different host of molecules than the grains. Often, you will hear brewers talk about alpha acid content in their beer. Alpha acids are the main bitter component of hops, and are extracted directly from the hop plant: they are not formed in the fermentation process. 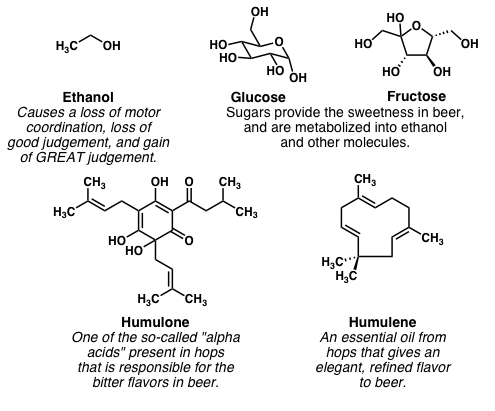 Humulone is the parent alpha acid in hops. All the other alpha acids are closely structurally related to humulone. Perhaps the most important alpha acid, however, is cohumulone: when you see the bittering units measurement on a package of hops, it’s just the percentage of cohumulone in that batch. Hops also contain essential oils such as humulene. Humulene imparts an elegant, refined flavor to beer. Although the bitter hop flavor is critical, too much can ruin a beer: overhopping your brew results in a flavor that’s generally disliked. As with most things, this comes down to preference and there are those of us (such as myself) who enjoy extremely highly hopped beers such as IPAs. Some common molecules responsible for "off flavors"
In addition to desirable flavors and ingredients, there are a number of chemicals that provide undesirable flavors to beer. These can be critical to the success of your homebrew, as it’s often difficult to control for the production of off flavors when you’re in your kitchen or basement. One of the more common off flavors results from a molecule called biacetyl. Biacetyl is a small molecule that smells like butter, and is actually used in the food industry to flavor popcorn. It’s amazingly potent, and a tiny amount can impart a noticeable buttery flavor to your beer. Another generally undesirable flavor can come from esters. Esters are oxygen containing molecules that usually smell like fruits. Isoamyl acetate is one ester often produced in beers that smells like bananas. Other fruity flavors in beer such as apple are produced from similar compounds. To avoid biacetyl, you should ensure that you boil your wort for long enough and use healthy, active yeast cultures. Lower ester content can be achieved by ensuring good fermentation temperatures. I’ve noticed more fruity flavors when I brew in the summertime, because I can’t keep my beer at the proper 65 °F. As Brother Barley mentioned in the most recent maltercation, some breweries (I believe the one he mentioned was Sam Smith) intentionally allow biacetyl in their beer, and it can be quite good. However, for most brews it just doesn’t taste great — homebrewers would do well to avoid it. Sometimes, homebrewers will complain about an astringent, or dry, puckering flavor. This is often caused by cyanidin, a type of moleule called a phenolic (or more commonly known as a tannin). Tannins are present in many fruit and grain husks, skins, and seeds, and are also present in wines, which you may know if you’re a loser and drink them. You can avoid tannins in your beer by not boiling specialty grains (they should only be in the brew kettle until the wort begins to boil) or grains. Removing the krausen during primary fermentation can also help avoid excessive tannins in your beer. One final example of an off flavor is a molecule called 3-methyl-2-butene-1-thiol. A long, boring name for a very important molecule. As you can see, this molecule contains sulfur. In general, sulfur molecules smell like rotten eggs, skunks, and other wonderful stuff. This one is no different – this is the molecule that is the reason beer “skunks.” It’s produced by a chemical reaction that is initiated by light – one reason why great beers almost never use green or clear bottles. And why you as a homebrewer never should either. So there’s your introduction to the chemistry of beer, hope you made it this far. Posted in Beer 101, Homebrewing. OK, I think I followed your logic but I’m still confused. When I take a sip of Bud Light it tastes like piss but smells like vomit. It’s not buttery, so no diacetyl, but it does present similarities to something I scraped off my shoe. Phenols? Tannins? I just can’t put my finger on where these scrumptious flavors come from. Ripped, did you just admit to drinking Bud Light??? I’m fairly confident that you’re right – the flavors in bud come from the fermentation of shoe scrapings. But who am I to say? What can I say, I needed some light to go with my Cheerios. Imperial IPA’s just weigh me down in the morning. Previous Post DESCHUTES, HE SCORES! Next Post GOING ROGUE, AGAIN?